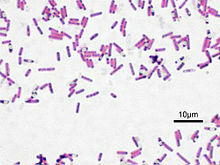 Bacilli refers tae a taxonomic class o bacteria. It includes twa orders, Bacillales an Lactobacillales, which contain several well-kent pathogens sucn as Bacillus anthracis (the cause o anthrax). This page wis last eeditit on 11 Januar 2015, at 18:59.